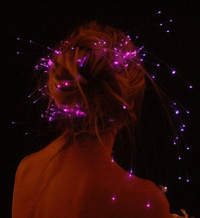 Add glowing specks of light in your hair with these great hair decorations. 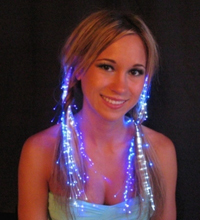 They actually glow from many points that you can weave into your hair. Create a festive and spectacular hairstyle for a prom, party, wedding, or performance. The barrette can be clipped into your hair, and the fiber optic strands can stick out for a dramatic look, or you can brush the strands into your hair like hair extensions for sparkles that seem to come from your hair. 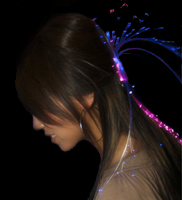 You can even cut the fiber optic strands for a custom hair style. Clip them in your hair, or on your clothes. 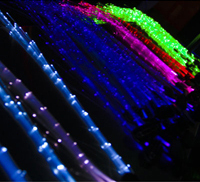 Get noticed at bars, nightclubs, raves, nighttime parties, or Burning Man. Make that Halloween costume sparkle! Create a headpiece for a fabulous 4th of July costume, with a red, a white and a blue Glowby that stick straight up like fireworks. Make an amazing Hula skirt from 20 Glowbys that shimmers as you dance. Clip some on the straps of your top to make sparkles on your chest and back. Clip some on your hat for a festive look, which looks like a glowing feather in your cap. Use your imagination. They are small, flat barrettes, about an inch and a half long with a bunch of about 50 clear fiber optic strands coming out of one edge. 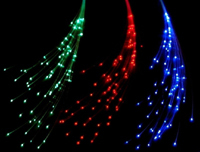 The fibers are various lengths, with the longest about 14 inches long. You can cut these fibers with scissors to create different effects. The barrette body contains two small flat watch type batteries that can be replaced when they start to get dim, in about 7 hours. Batteries are included. Glowbys will actually glow for about 50 hours on a fresh set of batteries, but they get progressively dimmer. We sell the batteries, or you can get them at most drug, electronic, or hardware stores. Our price for batteries is much lower than you will find in most stores. All Glowbys will work with CR1220 batteries. Price is for one Glowby barrette.